Celebrate the day of the dead festival with a themed look that celebrates South of the Border fashion and tradition this year. 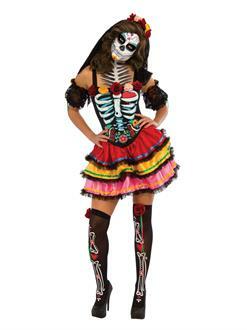 The Senorita Muerta Womens Costume will have you dancing the salsa with all of your friends thanks to this seasonal festive look. It looks right at home out on the dance floor, and thanks to its alluring fashion and style you can be sure you’ll have your pick of the best partners.